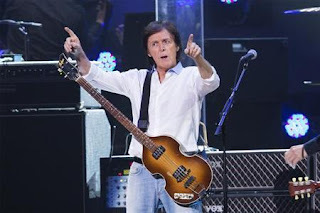 Paul McCartney will perform at the Bonnaroo Music and Arts Festival in Tennessee in June along with Tom Petty & The Heartbreakers, Mumford & Sons, Bjork and Wilco, festival organizers said on Tuesday. "Top to bottom, this is one of the strongest lineups we have ever had," Bonnaroo spokesman Jeff Cuellar said in an interview. "Looking at the festival landscape out there ... no other American festival has Mumford & Sons, Paul McCartney and Bjork all under one roof." Bonnaroo is among the top live music gatherings of the year, much like the Coachella Valley Music and Arts Festival in California and the Glastonbury Festival of Contemporary Performing Arts in Britain. Up to 100,000 fans flock to the annual festival in Manchester, Tennessee, to see singers, comedians, art and films. The 2013 concert lineup announced on Tuesday also included R. Kelly, Wu-Tang Clan, David Byrne & St. Vincent, ZZ Top, "Weird Al" Yankovic, Gov't Mule and Dwight Yoakam. Tickets for the festival go on sale February 23 on bonnaroo.com.